If you’d like to know more about Brazil than what time the matches are on, The Facts Lab Book of Brazil: 101 amazing facts about Brazil and the Brazilians is a carnival of information about the country and its people—some of it useful, some of it arcane, all of it entertaining. Compiled from a variety of sources, it takes you on a whirlwind tour of just some of the many aspects of this vibrant, colourful country and emerging global power. As you’d imagine, the Amazon and its rich natural resources get a mention. So too do Brazil’s scientific and innovative endeavours. You might be surprised to learn, for instance, that the Wright Brothers’ place in aviation history has a Brazilian challenger. Brazil’s contributions to music, dance and culture feature strongly. You’ll discover the true story of the girl from Ipanema—and what Ipanema really means. And did a Brazilian martial art really form the basis of breakdancing? And naturally the national obsession of football has its place. This special World Cup edition looks at both the tournaments hosted in Brazil—the 1950 version as well as the forthcoming extravaganza—and some of the players and achievements that have made the Seleção a perennial force to be reckoned with. 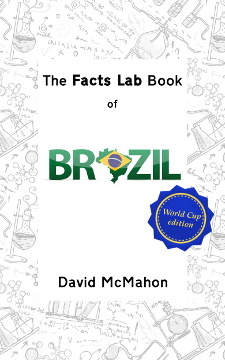 To celebrate the launch of The Facts Lab Book of Brazil , we’re giving it away free through the Kindle Store. But this offer only lasts from 0800 GMT on Friday 27 December until 0800 GMT on Sunday 29 December, so don’t miss out!